The $10,000 Walker and Doris Allen Fellowships recognize outstanding faculty members who have made exemplary contributions to the success of the University and its students. Up to three faculty members are selected each year. The Fellowships are open to all tenured or tenure-track faculty who have completed at least four years of full-time service at Truman. Eligible faculty may be nominated for the Fellowship by Truman faculty colleagues or academic departments. Previous recipients are not eligible. To date, the program has completed seven years of a scheduled eight-year program, with 21 faculty members being recognized with awards. Due to favorable investment returns, the fellowships are expected to continue until at least 2011. To nominate an eligible faculty member, send a letter of nomination to the Office of the Provost addressed to the Allen Fellowship Selection Committee. The letter of nomination should be no longer than one page and should address how you believe the faculty member fulfills the selection criteria. Please deliver a signed hardcopy of the letter to McClain Hall 203, send it through campus mail, or by fax to 785.7460. Visit http://www.truman.edu/pages/131.asp for details. Nominations are due by Oct. 1. Staff members from the Adair County Clerk’s Office will be at the Student Activities Fair from 12-4 p.m. Sept. 4. Truman students, faculty and staff will have the opportunity to register to vote in Adair County or give a change of address if needed. Those wanting to register to vote in Adair County will need to bring some form of ID. It takes about two minutes to get registered. For those who are registering for the first time, you will receive a card from the clerk’s office with your voting location a few weeks after registering. If you are registered to vote in your hometown and would like to vote in your home district, you must request an absentee ballot from your hometown clerk’s office. They will send you a ballot and then you must send a notarized ballot back to your home clerk. The business office in McClain Hall can notarize ballots for students. If you are not sure where you are registered to vote, you can call the Adair County Clerk’s Office as they have the ability to look up all Missouri voters through a statewide registry. If you have moved since you last voted in Adair County you need to update your address so they can let you know your new polling location. The last day to register to vote in the Nov. 4 election is Oct. 8. The clerk’s office is located downtown on the second floor of the courthouse. Their hours are 8:30 a.m. - 4:30 p.m. and they are closed for lunch from 12 - 1 p.m. Anyone with questions about voter registration or where they are to vote can call 665.3350. The former “Quiet Lounge,” located on the second floor of the Student Union Building, will be renamed now that the area has been renovated. Student suggestions will be accepted until Sept. 5. The final five names will be voted on during the open house, and the winning student will receive a $50 gift card. The Student Union Building will host an open house from 3-10 p.m. Sept. 9 to celebrate its early completion. This event will showcase the Student Union’s new facilities, as well as highlight many of the student service offices within the building. The open house will feature several special events, including free pizza and soda, a nicknaming contest, live music and door prize raffles. The pizza and soda will be available from 7-9 p.m. in the TV lounge located on the first floor. Students can enter the contest to rename the former “Quiet Lounge” until Sept. 5 by visiting http://sub.truman.edu. The Student Advisory Board will narrow the names down to five finalists, and students can vote for their choice during the open house from 3-8 p.m., with the announcement of the new name and contest winner at 8:30 p.m. The winning student will receive a $50 gift card to the Truman State University Bookstore. Live music will begin in the Down Under (first floor) at 7 p.m. Door prize raffles will be in the main Lounge beginning at 5 p.m. Many of the student service office staff will be available for students with questions about the new facilities and services offered during the open house. These new offices include the new Information Center and Main Street Market on the main causeway; Student ID, Student Union Administrative and Food Service Offices in Suite 2000; Student Affairs Office on the third floor and Center for Student Involvement on the first floor. Faculty, staff and students are all welcome to come. Questions about the event should be directed to Damon Ferlazzo, programs coordinator for the Student Union at damonf@truman.edu or 785.4186. Truman State University’s chapter of Sigma Delta Pi, a National Collegiate Hispanic Honor Society, has been chosen for the prestigious Ignacio and Sophie Galbis Award, a recognition the chapter also received in 2006. This award is presented annually to the most outstanding chapter nationwide for activities realized during the school year. This recognition is based upon the caliber of chapter projects that reflect the Sigma Delta Pi mission of honoring excellence in the study of the Spanish language, contributing to cultural understanding and upholding the goals of the Society. Lucy F. Lee, professor of Spanish, and 2004 recipient of the Jose Martel Award for the most exceptional chapter adviser for the 2001-04 triennium, was instrumental in earning this highest chapter-honor of Sigma Delta Pi. With its national office at The Citadel in Charleston, South Carolina, Sigma Delta Pi is a member of the Association of College Honor Societies, the nation’s only certifying agency for college and university honor societies. After just its first week, the Truman United Way campaign has reached nearly $17,000. United Way is local—the funds raised here stay here, and the low overhead means even more of your contribution dollars reach the people that you want to help. United Way is efficient—the one gift you make each year supports more than 30 local programs that help individuals pursue the goals of Education, Income and Health. Recent statistics show that the United Way touches 1 out of 3 individuals in our area. Please feel free to contact Brad Chambers in Advancement at 785.4124, Debra Kerby, professor of accounting, at 785.4363, or Nancy Pennington at the United Way of Adair County office at 665.1924 with any questions or to request a pledge form. Truman’s goal for this year’s fund drive is $56,000. The Public Relations Office has announced Kanna Taylor, a senior public communication major, as its intern for the fall semester. Taylor is from St. Peters, Mo., and is a 2005 graduate of Fort Zumwalt South High School. 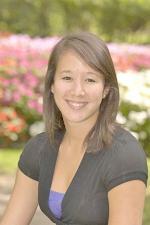 She is the daughter of Bob Taylor and Naomi Yoon and has a younger sibling, Kayla, who is a high school senior. As the intern, she will assist in the writing, producing and distributing of the University newsletter, Truman Today, as well as posting it online. She will also be responsible for writing press releases and performing various office duties. Taylor currently serves as the Vice President of co-ed honor fraternity Phi Sigma Pi and is a member of communication honor society Lambda Pi Eta, Student Ambassadors and the Advertising and Public Relations Organization. Taylor’s interest in obtaining experience and skills in various communication outlets has led her to this position. 2008 TruFit MOVE IT, LOSE IT Wellness program. TruFit MOVE IT, LOSE IT is a 12-week education and physical activity program focused on teaching group members the skills needed to empower lifetime health behavior changes. There will be an informational meeting Sept. 8 at 5:15 p.m. in Pershing (room to be determined). Regular meetings will begin Sept. 15 and continue through Dec. 1. For more information or to sign up, contact Jennifer Hurst at 665.4464 or jhurst@truman.edu. 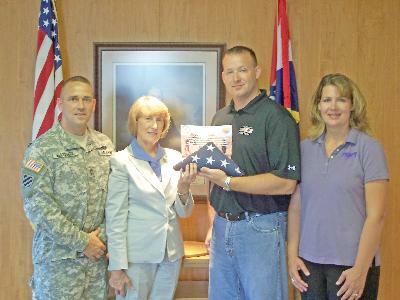 Air Force Staff Sergeant Ryan Lee (second from right) presents President Barbara Dixon with an American flag previously flown in Afghanistan. Lee, the brother of Residence Life Director Andrea O’Brien, presented the flag as a token of appreciation after Truman students organized a food drive and sent care packages to Lee and other soldiers stationed in Afghanistan last year. Pictured from left to right are Master Sergeant Jack Glasscock, who assisted in getting the packages to Afghanistan, President Dixon, Lee and O’Brien. The University Club will host a Welcome Back Barbecue at 6:30 p.m. Sept. 5. New faculty members are the special guests. Attendees are encouraged to bring a side dish to share. Barbecue from Western’s Meat Market and beverages will be provided. Music will be performed by Deadwood. Children are welcome. The goal of the new PDI, created by the Career Center and sponsored by Student Affairs, is to prepare students professionally and personally, for a smooth transition to life after college. 16 • Making the essential connections. 17 • How can I afford this? 7 • So you mean I have to pay it back? the 5 second resume scan. 14 • You never know who’s watching. • So tell me about yourself. Sessions are open to everyone on campus. To register go to http://pdi.truman.edu. The Military Science Department has received permission to close Franklin Street between Patterson and LaHarpe from 6:15-7 a.m. Sept. 8 to conduct their Army Physical Fitness Test. All classes take place from 11-11:45 a.m. Need a laptop computer? The library has laptop computers you can check out to use in the library only. They have the same University image with the same programs the University computer labs have. You can check them out with your Truman ID for two hours of use. They are available at the Circulation Desk on a first-come, first-serve basis. Due to Stokes Stadium construction delays caused by weather, Saturday's football game against Southern Arkansas has been relocated to the campus of William Jewell College in Liberty, Mo. The field should be ready for the next home game scheduled for 7 p.m. Sept. 13 against Central Missouri. Communication faculty members produced a customized COMM 170 public speaking text for this academic year. Barry Poyner, professor of communication, served as editor/compiler, and was assisted by students Nathan Vickers, a communication major from El Dorado Springs, Mo., and Jackie Ross a nursing major from Gladstone, Mo., as well as Kevin Minch, associate professor of communications, and James Cianciola, assistant professor of communication. Megan Dowdy, a junior visual communications major from Wildwood, Mo., is being honored by the national publication “Creative Quarterly” for her work in graphic design. Dowdy was named a bronze winner for work created during her sophomore year at Truman. Assistant professor of art Matthew Derezinski submitted Dowdy’s work earlier this year, and winners were listed in the July issue of the publication. Her work will be included in the next issue of “Creative Quarterly” scheduled for release in September. Warren Gooch, professor of music, has two original musical compositions that have been selected for performance in the 2008 Christian Fellowship of Art Music Composers National Conference Oct. 9-10 at Indiana Wesleyan University. “Fanfare and Alleluia” for antiphonal brass choir and “Let the Nations Tremble” for SATB choir and piano, will be performed at the festival by students of the host university and surrounding colleges. Andrew Green, a senior agricultural science major from Kansas City, Mo., spent the summer at Montana State University working with Dr. Luther Talbert, the spring wheat breeder for the state of Montana. Talbert develops new varieties of spring wheat by using molecular genetics and traditional breeding to solve problems such as disease and insects. Green worked in the field and in the laboratory. Julie Lochbaum, director of faculty development and the Center for Teaching and Learning, and Diane Richmond, instructional designer for the Center for Teaching and Learning, co-presented “Podcasting: Why and How to Get Faculty to Use This Pedagogical Tool,” at the fifth annual EduComm conference in June in Las Vegas. The conference was sponsored by the magazine “University Business,” which also mentioned the presentation in its August publication. Barry Poyner, professor of communication, edited the book, “This Is My Story: Sharing the Gospel,” this summer. He also wrote two devotional articles for the quarterly magazine Power for Today. His review, “Precious Memories: The Rhetoric of Southern Gospel Music,” appeared in the “Journal of Communication and Religion.” Poyner also provides voiceovers, commercials and segments for the television show “One Another Christianity,” which appears at 8 a.m., Sundays, on KYOU. Thomas Trimborn, professor of music, will have images from his book “Encounters With Lincoln” featured in a video to be shown in the new Center for Education and Leadership in Washington, D.C., which focuses on the life and legacy of President Lincoln. The Center will be part of the newly renovated Ford’s Theatre, scheduled for completion by February 2009. The A&E Television Network is producing the video and contacted Trimborn about using his artwork. The Tel Alumni campaign is now hiring students to work during the fall semester. Students need to have an outgoing personality with good communication skills on and off the phone. A reliable and dependable work ethic and a willingness to ask parents and alumni for financial support are also needed. No experience is necessary, and Tel Alumni offers paid training. In addition to institutional wages, Tel Alumni has nightly incentives, including prizes and food. Tel Alumni also allows students to choose the nights they want to work. Students can select a minimum of two of the following shifts: Sunday from 3-7 p.m.; Monday 6-9 p.m.; Tuesday 6-9 p.m.; Wednesday 6-9 p.m.; or Thursday 6-9 p.m. For more information contact Robyn Kollar at 785.4133 or rkollar@truman.edu, or stop by the Office of Advancement located at 100 McClain Hall. The application deadline is Sept. 8. The Next STEP office is looking for highly-motivated science, mathematics and computer science students to work as paid tutors. Tutors will receive formal training that will lead to national certification. For more information go to http://step.truman.edu/tutortraining. P.A.T.C.H. will host its first informational meeting at 8 p.m. Sept. 3 in Pershing Building 234. P.A.T.C.H. acts as a support group/network for all persons with incurable illness. For more information e-mail patchtsu@gmail.com. The Center for Teaching and Learning is sponsoring the Faculty Weekly Lunch Series beginning at 12:30 p.m. Sept. 3 in the Student Union Spanish Room. The first topic is “Using the New York Times in Truman Courses.” For more information contact Linda Davenport at 785.4301 or lindadav@truman.edu. Ceilidh Club is sponsoring an Irish Dance at 6:30 p.m. Sept. 3 in Baldwin Hall 303. Students are invited to attend the Activities Fair from noon to 4 p.m. Sept. 4 on the Quadrangle. Approximately 150 chartered student organizations, along with various departments and outside vendors, will display the services they have to offer to students. In addition to entertainment, lots of free items will be given away to students. Contact the Center for Student Involvement at 785.4222 for more information. Alpha Chi Sigma will host a public tie-dye at 6 p.m. Sept. 4 in Magruder Hall 1025. Cost is $5 to dye a shirt and $10 to buy and dye a shirt. Other 100% cotton items can be dyed with prices depending on size of the item. Bullets Rugby will have an informational meeting at 7 p.m. Sept. 4 in Baldwin Hall 314. A Disability Studies (DS) minor meeting will take place at 12:30 p.m. Sept. 5 in VH 1320. A small group of Truman faculty are working to develop the DS minor and are seeking help. They are also looking for existing courses that include some component related to disability or offer the flexibility for students to focus course activities and assignments on disability. For more information contact Janet Gooch at JQuinzer@truman.edu or Pete Kelly at pkelly@truman.edu. Recreation Center Aerobic Room. No previous dance experience is required, and all are welcome. The Equestrian Team will host an informational meeting at 7 p.m. Sept. 8 in Magruder Hall 1000. The Delta Sigma Pi Cocktail Party will take place at 6 p.m. Sept. 8 in Georgian Room A in the Student Union Building. High Street Dancers will host tryout clinics starting Sept. 8 in the small gym, located at Pershing Building 130. Students who enjoy jazz, hip-hop and lyrical dancing can come to the clinics Sept. 8 and 11, to learn the combinations for the 2008-2009 tryouts. A review will take place Sept. 12 from 7:30-9 p.m., and tryouts will take place Sept. 13 at 9 a.m. There is a $3 tryout fee. High Street Dancers perform at many campus and local events. For more information contact Melody Jennings at 785.7259 or jennings@truman.edu. Delta Sigma Theta Sorority is sponsoring Truman Survival at 5 p.m. Sept. 8 in the Down Under of the Student Union Building to help students navigate the ups and downs of college life. For more information e-mail Danielle Tolson at dstzetazeta@truman.edu. Women’s a cappella group Minor Detail will conduct auditions at 6 p.m. Sept. 9 in Ophelia Parish 2117. Those auditioning should prepare a one-minute song, or portion of a song, that shows off their voice. Vocal percussion interest is welcome. A sign-up sheet will be posted on the door of Centennial Hall 212. For more information go to http://minordetail.truman.edu, or contact Jordan Worcester at joworcester@gmail.com. Students in Free Enterprise, a business organization that teaches the fundamentals of free enterprise to the community, will host informational meetings from 6-6:30 p.m. Sept. 9-11 in Violette Hall.